South and North Korea held a groundbreaking ceremony Wednesday to highlight the significance of their goal of modernizing and reconnecting cross-border railways and roads, amid the Seoul government’s efforts to improve inter-Korean relations despite stalled denuclearization talks between Washington and Pyongyang. The ceremony kicked off at Panmun Station in the North’s border town of Kaesong at around 10 a.m., according to the South’s Ministry of Unification. Several ranking officials from both Koreas and foreign officials attended the event. Earlier in the day, a special Kaesong-bound train transported some 100 South Koreans to the ceremony. Among them were Transport Minister Kim Hyun-mee, Unification Minister Cho Myoung-gyon, parliamentary leaders and other government officials. 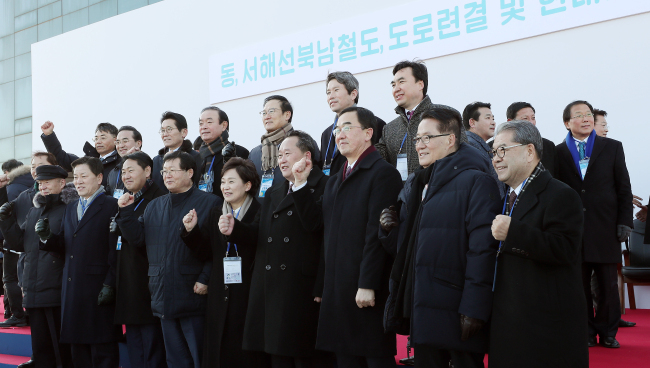 At the event, they were joined by Ri Son-gwon, chairman of the North’s Committee for the Peaceful Reunification of the Country, and Vice Railway Minister Kim Yun-hyok, who led a delegation of some 100 North Koreans. The South’s transport minister and the North’s vice railway minister took turns delivering key celebratory speeches followed by such events as track-linking, signing a railway sleeper and unveiling a signboard at the station, according to pool reports. “Announcing the reconnection and modernization of the North-South railways and roads, at a time of a historical turning point for unification of the two Koreas and escalated hopes for peace and prosperity, is a meaningful event that will leave its mark on our peoples’ history and showcase our power and will for unification to the international community,” the North’s Kim Yun-hyok told the crowd gathered at the event. “The outcome of the North-South railways and roads project depends on our peoples’ willpower and we cannot achieve the ‘unified federation’ we hope for if we continue to be swayed by others’ opinions,” he added. Kim Hyun mee said the reconnection of railways would act as a catalyst for a slew of inter-Korean cooperation projects in various areas. Both then proceeded to co-sign the sleeper, which included messages marking the event and highlighting the cooperation between the two Koreas on the railway and road project. 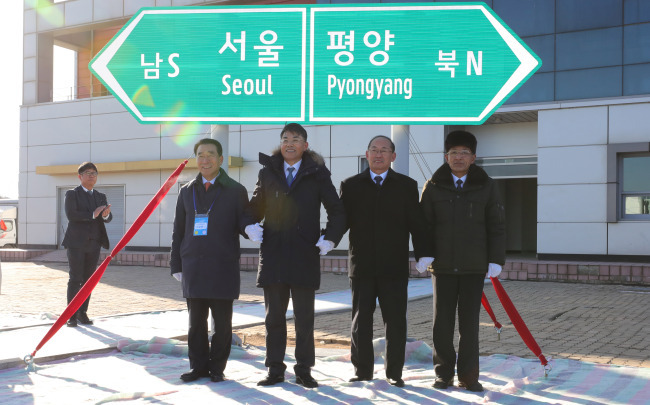 A signboard that pointed to both the South’s capital of Seoul and the North’s Pyongyang was unveiled as well. Officials from the UN, China, Russia and Mongolia also attended, witnessing what could be viewed as the start of an ambitious plan to connect the inter-Korean railway to the Trans-Siberian Railway -- potentially connecting the Korean Peninsula to Europe. Armida Alisjahbana, executive secretary of the UN Economic and Social Commission for Asia and the Pacific, Vladimir Tokarev, Russia’s vice transport minister, and Mongolian Transport Minister Sodbaatar Yangug all voiced support for the railway project. A Unification Ministry official here said that her attendance reflects that Korean Peninsula issues are not confined to Asia, as they require global cooperation on matters related to denuclearization and sanctions. In a separate briefing, the Unification Ministry reiterated that the event was “symbolic,” indirectly pointing to sanctions in place against the North, and added that it plans to further inspect roads and railways before moving to the stage of actual construction. Meanwhile, South Korea’s political sphere was divided over the event. The ruling Democratic Party of Korea voiced high hopes for the event, while the main opposition Liberty Korea Party labeled it as a mere “trick” to raise President Moon’s approval rating. Moon’s approval rating plunged to a new low of 47.1 percent in a poll conducted by Realmeter, the lowest since the president took office in May 2017. The groundbreaking ceremony came after the UN granted a sanctions exemption for the event regarding materials that were to enter the North. The US has also expressed support for the event through a US-South Korea working-level meeting held last week in Seoul. But it continues to stress that the sanctions will remain in place unless noteworthy progress is made on stalled nuclear talks with North Korea and that steps in inter-Korean ties should be in tandem with the talks. The two Koreas recently completed an 18-day inspection of sections of cross-border railways in North Korea that run along the west and east coasts of the Korean Peninsula. The leaders of the two Koreas agreed in April to modernize and connect roads and railways across their border, a project aimed at fostering balanced development and co-prosperity on the Korean Peninsula.